Help skin remain strong, soft and smooth. ELEMIS Gift Sets offer the very best of ELEMIS' award-winning products. At outstanding value for money,choose from an array of luxury collections and skincare introductions. As an indulgent treat for yourself or perhaps as something special for someone. The gift sets are perfect to take away with you to keep skin looking smooth, fresh and radiant on the move. From luxurious candles to beautifully boxed gift sets, with Elemis you can rest assured you’ll be in the good books when it comes to the present unwrapping this Christmas. Whether you’re treating yourself to your Elemis favourites, or seeking something to put a smile on the face of your special someone, Gorgeous Shop has you covered. At outstanding value for money the luxury gifts are sure to impress; from carefully curated collections of Elemis’ best-selling Pro-Collagen range, including the Gift of Pro-Collagen Gift Set which contains seven Pro-Collagen best sellers, to the Frangipani Treasures Gift Set, perfect for lovers of exotic fragrances and indulgent skincare. We’ve even got the guys covered, with The Adventurer, The Gentle Man and The Super Man Gift Sets. Perfect for introducing the man in your life to the indulgence of Elemis, each gift set has been carefully created to include well-matched Elemis products to invigorate, refresh, smooth and restore. The ultimate Elemis Christmas isn’t complete without one of the brand’s gorgeous scented candles. Joyful Glow is the perfect candle for bringing a warm and welcoming glow to your home, scented with aromatics of Vanilla, Orange and Cinnamon, while Soothing Glow will enable you to bring the scent of an Elemis spa home thanks to the signature fragrance of Pro-Collagen Cleansing Balm’s Lavender, Eucalyptus and Geranium. So whether you go for a Pro-Collagen Christmas or a Frangipani festive season, you’re sure to find a deal worth decking the halls for with Elemis Gift Sets at Gorgeous Shop. ELEMIS Cleanse & Tone is a range of premiere products. This cleansing range of active products have been formulated for varying skin types - from the sensitive, to dry to oily. Each product has skin nourishing properties, however if your primary concern is ageing skin then look no further than the Pro (silver) range. ELEMIS Exfoliators & Masks cleanse, smooth and balance skin to reveal a radiant, youthful complexion. ELEMIS Moisturise & Protect products are a collection of all your skin requirements. Whether you need a daily moisturiser or night cream, or perhaps require a concentrated treatment for a specific area, the eyes for example, browse through this collection of proven effective products and find your match. It must be said that with products designed for a spa, the therapeutic benefits of these treatments should not be ignored; it is a joy to wear the ELEMIS Exotic Cream Moisturising Mask or to massage ELEMIS Pro-Collagen Marine Cream into your skin because your skin feels instantly better after doing so. The replenishing and protecting properties of all these products ensure that your skin feels balanced and the most naturally healthy that it can do. ELEMIS Eye products smooth & brighten the delicate eye area. Targeting concerns of ageing and dehydration, ELEMIS Eye creams and serums decongest and firm the skin to reveal a youthful, radiant result. Formulated with plant-based, nutrient-dense Superfoods and some with a natural sugar derived Pre-Biotic, NEW Superfood Skincare System helps to replenish skin with vital hydrating nourishment, for a healthy, outdoor-fresh glow. ELEMIS Pro-Collagen - Anti-Ageing is a full collection of anti-ageing-targeted products. Specifically formulated to actively smooth, and protect your skin. Marine extract Padina Pavonica is the main active ingredient within this range, it has been proven to reduce the appearance of wrinkle depth dramatically. ELEMIS Body Care products contain essential oils that transport your mind to a relaxing destination. Whilst nourishing your skin from within.Our particular favorites include the cult Skin Nourishing Milk Bath which has just celebrated 20 years of being in circulation, suitable for even the most sensitive skins and derived from the very ingredients list that Cleopatra used to put in her bath - Natural Plant Collagen, Oat Extract and Japanese Camellia Oil to feed the skin. ELEMIS Suncare products will take care of your skin from face to feet before, during and after sun. Choose your perfect protection level and enjoy massaging these luxurious products into your skin. The result is softer, smoother and protected skin, and we all know the secret to younger looking skin is to protect it from harmful UV rays. Boost your mood and general wellbeing with the beautifully fragranced, uplifting Life Elixirs. 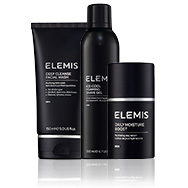 ELEMIS Men is a full collection of pre, during and post-shave care products. Designed with men's individual skincare requirements in mind. Many of the products combine scientifically renowned anti-ageing ingredients with naturally occurring plant extracts to help your skin remain strong, soft and smooth. 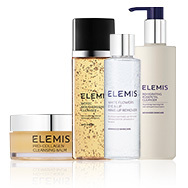 View all ELEMIS skin care products in one place. Over 6.5 million spa goers choose Elemis as their go to brand every year and that doesn’t even include the millions that treat themselves everyday with Elemis’ best loved at- home products. With over 25 years of wisdom in the professional spa arena Elemis continues to lead the way with their innovative use of active natural ingredients and the scientific advancements for which they are so well known. Elemis was born out of the vision to bring together the power of nature, science and aromatics in a way that would completely transform the front line of the beauty industry. The many accolades and awards that Elemis receives each year is a testament to the efficacy and delight that their products bring to their fans around the globe. Find out why Pro-Collagen is ELEMIS' most loved range. See how ELEMIS Life Elixirs are used to help you have a good night’s sleep. How to use ELEMIS' Cleansing Oil in your skincare routine. ELEMIS are perhaps most well-known for the phenomenally successful Pro Collagen Range and the Pro Collagen Marine Cream in particular; with one being sold every 9 seconds! The unique formula harnesses powerful Mediterranean algae, Padina Pavonica blended with Ginkgo Biloba and precious, highly concentrated absolutes of Rose and Mimosa to provide superior free radical protection, and the ultimate anti ageing moisturiser and now offers even more protection with their latest Pro Collagen Marine Cream SPF30 variation. Boasting impressive clinical results, that prove an increase in hydration of up to 248% after just one hour, and 177% after a full 12 hours. Pro Collagen Marine Cream has also proven to increase skin firmess and reduce wrinkle depth in just 15 days. Biotec – When both environmental factors and life style begin to take its toll on your skin, if it’s dull, tired and slack, choose Biotec to reboot your complexion. Ground breaking Bio Energy Complex re-energises diminishing skin cells, awakening them from within resulting in radiant, youthful, healthy looking skin. Dynamic Resurfacing - smooth and refine skin tone and texture with Dynamic Resurfacing. With ELEMIS’ patented Tri Enyzme technology to effectively and safely resurface the skin using non abrasive exfoliation. Skin is radiant and fully prepared to make the most from the next stages of your skincare regime. ELEMIS also believe in looking after yourself with a luxurious bodycare ritual. At the heart of ELEMIS products are their wonderful aromatics and beautiful textures. Lose yourself in the exotic aroma of one of Elemis’ bestsellers, Frangipani Monoi Body Oil. Quickly absorbed into the skin to offer incredible moisturisation, it can also be used as a weekly nourishing hair treatment. Elemis Skin Nourishing Milk Bath - A multi award winning and multi use product, ELEMIS Skin Nourishing Milk Bath is a skin softening treatment with a soft, delicate,delicious scent. Use 3 caps in a relaxing bath, or use neat onto the skin where it is dry or irritated, or just as a lightweight all over body moisturiser. Can also be used as a facial cleanser if skin is particularly dry and sensitive. ELEMIS gift sets make the perfect presents anytime of the year. ELEMIS’ Christmas gift sets are particularly sought after. Always beautifully designed each year they not only make wonderful gifts, but ELEMIS offers such incredible value many loyal fans treat themselves for the chance to try many more of their products for a fraction of the cost.